Earlier Sinha had slammed the BJP for denying ticket to LK Advani MM Joshi “without their consent”. New Delhi: After being snubbed by BJP, actor-turned-politician Shatrughan Sinha is leaving no stone unturned to attack PM Narendra Modi and his government. Sinha, who is likely to join Congress party on April 6, has now called PM Modi ‘outgoing Sirji’ on micro-blogging site Twitter. He also criticised the speeches of Prime Minister Modi and claimed that they lack “lack content and depth” these days. Sinha’s series of tweets came as Congress chief Rahul Gandhi,released the manifesto for Lok Sabha elections 2019. 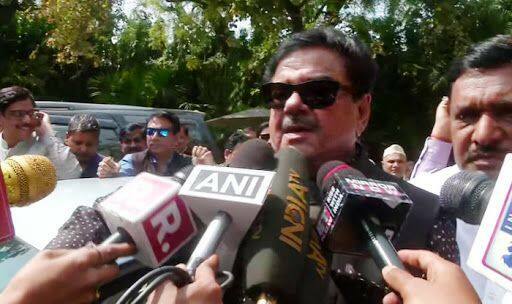 After the denial of ticket from Patna Sahib, Shatrughan Sinha met Rahul Gandhi last week and is set to formally join the Congress on April 6. “Painfully….on the way out of BJP….But hopefully in the best direction under the dynamic leadership of my dear friend Lalu Yadav and the desirable, most talked about leader from the Nehru Gandhi family… the true family of nation builders,” Sinha had tweeted.